The Eden point pictured above is a cast of one found on December 3, 1966 by Millard J. McDowell. 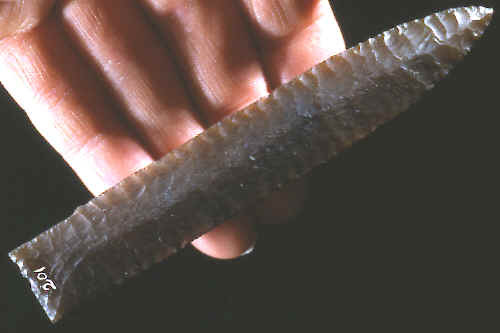 It was found in a dry wash approximately 15 miles southwest of Bairoil in Sweetwater County, Wyoming. A portion of the bank had broken off following a heavy rain. This Eden point was added to the famous Virgil Russell collection on March 23, 1968 and was considered the second best example in the collection. 1957, "Ancient Man In North America", H. M. Wormington, p. 124.